This week is a crazy one. I’m speaking at three different schools to three different age groups about one thing: Writing. Today I’ll be at an area elementary school. The coordinator asked that I talk about my background in writing (basically we didn’t have cable, video games, or a computer in my house…but we did have a kazillion books and a nice sized backyard…imagination was my favorite toy). She also asked that I talk about the hard work that goes into it. Thinking about my writing life, I got to contemplating the rejections. Why would I want to focus on that? Some of the rejections have been painful, some of them were unexpected or rude or just plain mean. 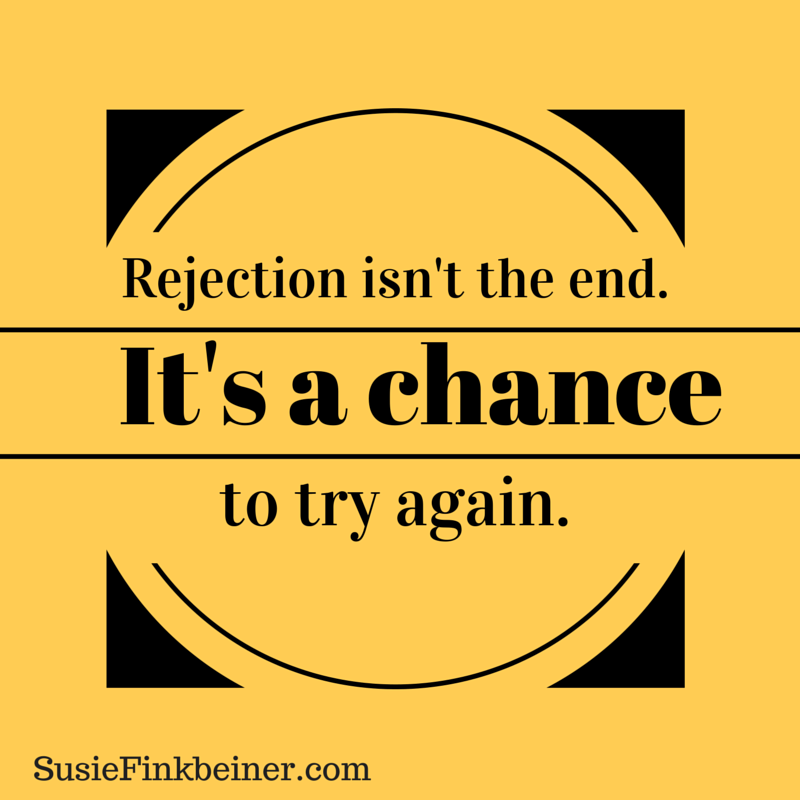 I focus on the rejection because it’s part of my writing. Each rejection has played a part in who I am as a novelist. I look back at those rejections and see how I didn’t quit. I pressed on. I cried a little, ate a little chocolate, and went back to work. And I see where God has put me. The opportunities He’s given me to write my stories. And along the way, I’ve learned that rejection isn’t the end. It’s a chance to try again. You are so right. It’s just part of the writing life. Thanks for the encouraging post. It’s taken me a long time to get my head around this. Thank YOU for being an editor who cares. I wish people could know how really amazing most editor truly are. Truly, I now see my rejections as a badge of honor. Each rejection was another time I tried. Joanne, I’ll be talking about this on Friday for sure! I am SO glad you kept trying! If you hadn’t kept on going I would have missed out on some terrific books! I can only imagine the pain of those rejections and I hope all the people you have touched have eased that sting. Someone very close to me keeps encouraging me put things in writing – she seems to think I can. lol. Thank you, Beth! You know, the rejections lose their sting after awhile. Not to say I love them, but they don’t hurt as much anymore. What do you have to lose? Go for it! Sorry about the dry period, Myrna! But I know that on the other side is a period of inspiration. Keep going. You can do it!